It is formulated using a broad spectrum of anti-fungal ingredients in order to target the many different types of yeast organisms that can exist in the body. Yeast is a pleomorphic organism, which means it can change form. Just as certain bacteria have been known to become antibiotic resistant, yeast can become antifungal resistant. By using more than one type of antifungal, yeast is not likely to adapt. Grapefruit Seed Extract Powder (Citrus paradisi), Barberry Root Powder (Barberis vulgaris), Clove Bud Powder (Syzygium aromaticum), Garlic Bulb Extract Powder (Allium sativum), Olive Leaf Powder (Olea europa), Peppermint Leaf Powder (Mentha piperita), Vegetable Capsule Shell (hydroxypropyl methylcellulose, water). Take 2 capsules in the morning and 2 capsules in the evening. Take both sets of capsules away from food, with a glass of water. PLEASE NOTE: People who have Candida are usually symptomatic. For mild to moderate Candida, 1 round of CanadiGONE should be sufficient. If your Candida is severe, you may require multiple rounds. You should continue cleansing until symptoms subside. 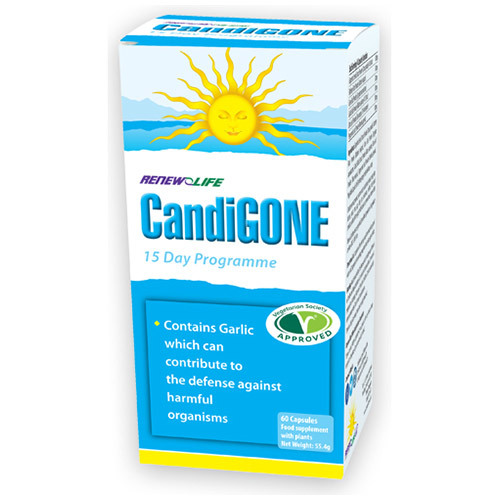 Below are reviews of Renew Life CandiGONE - 60 Capsules by bodykind customers. If you have tried this product we'd love to hear what you think so please leave a review.